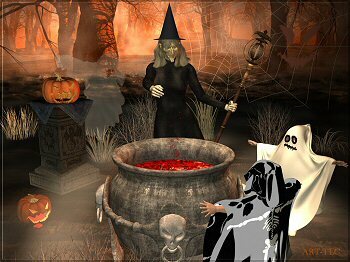 An animated 3D fantasy image of small trick or treaters being mezmerized by a Witch Brewing a spell. Happy magic spell casting Halloween! Download Witch's Brew Wallpaper and an "animated wallpaper" of her, too! Images and Screensaver copyright, ART-TLC ©.This screensaver fits any screen settings.